It was my dad`s birthday two weeks ago and I decided I wanted to make him a cake. Several problems with this idea, though. Problem 1: He doesn`t like "American" cakes because they`re always too sweet for him. Problem 2: I don`t have any other cake recipes aside from "American" cakes. I came up with an idea to make him a cake they sell at Chinese bakeries, because those aren`t too sweet. I Googled and found a recipe! I was so ecstatic to try making it. Let me tell you, if you didn`t know already, making a layered cake takes a LOT of time. I mean, I figured they were very time-consuming. But, wow. Luckily, I love baking, so all of this was pretty new and exciting for me. However, I`m pretty sure I didn`t know what I was doing most of the time. The only sure thing I knew I was doing right was baking the cake. The picture of the cake above looks odd because I made this cake at my campus apartment and by the time I transferred it to home...well, transporting cake isn`t easy. By the time we were going to surprise my dad, 1 raspberry fell off, the frosting touched the sides of my cake carrier, and the juice from the fruits were leaking onto the frosting. It was a tiny cake and the layers were really thin (about half an inch) but, it was perfect for my family since my parents aren`t too big on eating cakes. I was nervous because I couldn`t try the cake beforehand, so I didn`t know if it was going to be good or not. Thankfully, it was DELICIOUS. I`m not a much of cake lover, but I would definitely eat this cake again. I even had two servings in sitting! My youngest sister and boyfriend was surprised at how much they each like it as well! I also added toasted sweetened coconut at the bottom of the cake after I took the picture. They were a perfect addition, I must say. I suggest you to do the same, but add them right before serving so the coconut stays crunchy. 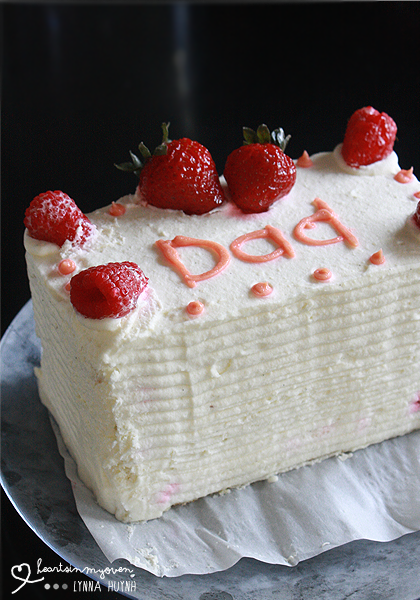 Unfortunately, my dad didn`t like the cake because he said it was too sweet. He admits it was a good cake, but it wasn`t his cup of tea. So, don`t let that keep you from making this cake if you`re interested! 4. Add 3/4 cup milk and stir until mixture is smooth. 6. Heat mixture for about 2 more minutes so it thickens and remove it from the heat. 7. Add the egg mixture from step 1 while whisking to combine. 8. Heat the mixture until it begins boiling. 9. Remove mixture from heat. 11. Transfer to a bowl and wrap it (touching the top) and refrigerate for at least 2 hours. 12. Preheat oven to 340F. 13. Line baking pans with parchment paper. 14. Beat 6 tablespoons of sugar with the egg yolks until you get a pale yellow color. 17. Carefully fold 1/2 of the egg whites into the egg yolk mixture. 18. Slowly add the flour and mix. 19. Then, add the oil and milk, combine. 22. Divide batter into two pans. 24. Make sure to freeze your mixing bowl and beaters for at least 10 minutes. 25. Meanwhile, in a heat safe small bowl, add the cold water and gelatin and let it sit for 5 minutes, until it turns clear and thick. 26. Set the small bowl in a saucepan with simmering water and stir the gelatin until it's in liquid form. 27. Take mixing bowl and beaters from the freezer and quickly add the heavy whipping cream. 28. With your electric mixer, beat the cream until it starts to thicken and beaters leave a trail in the cream. 29. Add the vanilla bean, powdered sugar, and gelatin and beat cream until stiff peaks. 30. Wash and dry your berries. Cut strawberries, leaving a few to top the cake. 31. Soak 1 teaspoon of gelatin in 3 tablespoons of cold water in a heat safe bowl and set aside for 5 minutes. 32. Set the bowl in a saucepan with simmering water and stir the gelatin until it's in liquid form/melted. 33. Dip fruits, one at a time, into the glaze and set on parchment paper. 37. Make syrup for the cake by mixing together the 1 tablespoon sugar and 2 tablespoons water. 38. Place a small sheet of parchment paper at the bottom of the first layer and surround the sides with more, so your plate will be clean after frosting. 39. 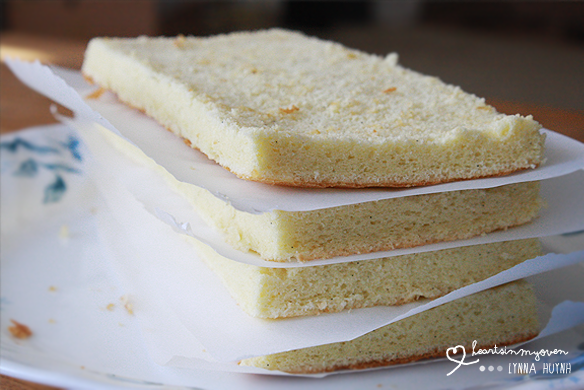 Using a pastry brush, brush the simple syrup on all sides of the cake. 40. Spread custard on top of the bottom layer. 42. Top with another layer of cake. 43. Repeat steps 40 and 41 until your cake is complete. 44. Using an offset spatula, do a crumb coat by spreading a thin layer of whipped cream frosting. 45. Place in freezer for about 30 minutes, or until frosting is set. 47. Top finished cake with glaze fruit. What a special treat for your dad. This cake is absolutely beautiful! Great job. I also have problem with sweet American cake actually and always prefer Japanese/Chinese bakery cake. Not so sugary and sweetness is gentle. :) Your sponge cake looks so fluffy and delicious! You made a beautiful cake darling!! Layer cakes are definitely some work but the final product is sooooo yummy :) Your dad is a lucky guy!